After getting rid of some pans (got rid of all my nonsticks, and mothballed my cast iron), I'm thinking about a daily driver from carbon steel. I usually cook for two, so the dilemma is between a ~12" and a 10". This is of course the outer diameter, and not the cooking surface, but that's how it's measured. Also, if someone thinks a French skillet is superior to a regular frying pan (geometry-wise), I'm all ears (never used a French skillet form factor). I lean toward the 10", since I cook mainly for two, but ATK etc. recommend 12"-13" in their tests. My concern regarding the 12" pans is the weight. I know carbon steel is lighter than cast iron, but the bigger you go, the weight catches up, and if it's unwieldy, it will go the way of my cast iron pan and the Dodo. I have several in each size but we tend to reach for the larger 12" pans to be sure there is "enough room". Varies by recipe, of course. Not sure if you have a Sur la Table near you (online too) but I can recommend their steel skillets. For the money, they are about as good as All-Clad for much less money. But I love my All-Clads as well - my set is over 20 years old and cleans up to look brand new. OK, I have a 12" (Matfer Bourgeat 062005 11-7/8" Round Frying Pan) with arthritis in my hands I find it a bit heavy. A 10" might have been a better fit for my hand strength. (03-10-2017, 01:37 PM)doc47 Wrote: OK, I have a 12" (Matfer Bourgeat 062005 11-7/8" Round Frying Pan) with arthritis in my hands I find it a bit heavy. A 10" might have been a better fit for my hand strength. And I find the Matfer pan that Doc finds objectionable to be my everyday, always on the range and never put away pan. It's about 8" for the working surface. I wish they marketed them that way but they don't. Who cares about 1" above where the heat is? I cook nothing floating 1" over the cooking surface of the pan. If you're looking to cooks eggs and such in the morning I had absolutely no problem frying a few eggs in the 9" crepe pan while I was waiting for the 11 7/8" pan or whatever they call it. Of course it will also make crepes but I've never used it for that (yet). The sides are much lower on it. I wish they made a much larger pan with those sidewalls for pancakes. (03-10-2017, 02:56 PM)ShadowsDad Wrote: And I find the Matfer pan that Doc finds objectionable to be my everyday, always on the range and never put away pan. It's about 8" for the working surface. I wish they marketed them that way but they don't. Who cares about 1" above where the heat is? I cook nothing floating 1" over the cooking surface of the pan. That would make it a carbon steel griddle? Thanks for the input guys, I think I'll go with 10" (8" working surface). I saw something like that years ago at our local food service supplier, but didn't know about CS pans at the time. If it's going to be one, the All Clad 12 inch Stainless, hands down. Great heat distribution, just the right size, and for most uses better than a French-style skillet. Carbon steel is nice, but much more finicky. The All Clad takes the toughest of use, cleans up well and if I had to have only one skillet, this would be it. (03-11-2017, 08:13 AM)Michael P Wrote: If it's going to be one, the All Clad 12 inch Stainless, hands down. Great heat distribution, just the right size, and for most uses better than a French-style skillet. Carbon steel is nice, but much more finicky. The All Clad takes the toughest of use, cleans up well and if I had to have only one skillet, this would be it. I've got a ~24cm stainless multiply kuhn rikon, and I use it all the time, but it's good for certain things, non-stick not so much. I don't mind when it's a steak, because fond is the goal, but fish, and other delicate food mostly stick even with correct pre heating, correct oil temperature, etc. Stainless is great for acidic dishes that would strip the CS seasoning, and I can live happily with just this pan (and have been so far...), but it's slightly on the smaller side (~9.45" external diameter), and sometimes you just need non-stick, and not through a ripping-hot skillet. @Michael, what do you usually do for delicate stuff like fish with skin, or a sunny-side-up? That's what I found also DJ. I get by with my CS pans and SS and I need them both. I don't want to cook everything in my CS pans or everything in a SS pan. I like the seasoning the CS pans have developed; nothing sticks. Not even problem items stick. I've found that they're even better than any coated non-stick pan, plus they don't wear out the way a coated pan does. We have one (expensive) coated pan and when it wears out it's not going to be replaced. A CS pan is not difficult to re-season if the seasoning does strip. It's done in minutes and it's no big deal. I just like to keep my "black steel" pans black with seasoning and not brown and definitely not grey. The black is more a badge of my expertise with the pan than anything else. I also very rarely clean my 11 7/8" pan; it's the one always out on the rangetop and only gets put away when the big pan comes out (14"?). I only clean it when it absolutely needs it because something drooled onto the surface and it's the easiest way to get rid of it*. Then it's just with hot running water and with a papertowel. I've never removed seasoning done that way as long as the pan is cool. With a hot pan the seasoning is coming off. Heck, I don't even remove the grease/oil from previous fry jobs unless it'll clash with what I have going into the pan today. Bits of food submerged in previously hot oil grease can't spoil. It could be a problem and I don't trust it if it's out in the air. * many times I'll just use a metal spatula and get rid of the particles scraped up by making an omelet for the dogs food. That cleans it for our use. When I do re-season (rarely) I use flax oil because I read somewhere that it has the toughest seasoning. BTW, I tried to season a SS pan... It doesn't season. (03-11-2017, 01:57 PM)ShadowsDad Wrote: That's what I found also DJ. I get by with my CS pans and SS and I need them both. I don't want to cook everything in my CS pans or everything in a SS pan. I like the seasoning the CS pans have developed; nothing sticks. Not even problem items stick. I've found that they're even better than any coated non-stick pan, plus they don't wear out the way a coated pan does. We have one (expensive) coated pan and when it wears out it's not going to be replaced. Yeah, I also used flaxseed oil reading the same thing I guess, but coconut oil and basically everything I use from lard to shmaltz and ghee works​ great. The only times something sticks I use hot water and a nylon brush, wipe with paper towel, put on low heat for a few minutes and wipe a thin layer of oil. Thanks for all the tips. Been doing a lot more cooking lately and have decided I HATE our current frying pans. Gonna check out some of these suggestions. I invested in rubber handle covers for my pans after I posted. They will protect against heat and should make the handle a bit larger and much easier to grip, or so I am hoping. I also purchased a 10" so I have the option to pick the best size for the preparation. @donnerjack If I only had one pan, I could make the 12" All Clad work for sunny side up and fish, although it's tricky, even with correct heating of the pan and oil. I have a Matfer Bourgeat 12" (actually 11 7/8) Carbon Steel that works really well for eggs and fish. Also a Wagner Cast Iron from the 30s that's got a multi-decade seasoning on it. All that being said, just like I'll reach for a synthetic shaving brush once in awhile just because it's so foolproof (as opposed to the massive Simpson Chubby 3 in Manchurian or a 30mm M&F), I'll reach for the T-Fal 12 inch non-stick when I just don't feel like being careful. 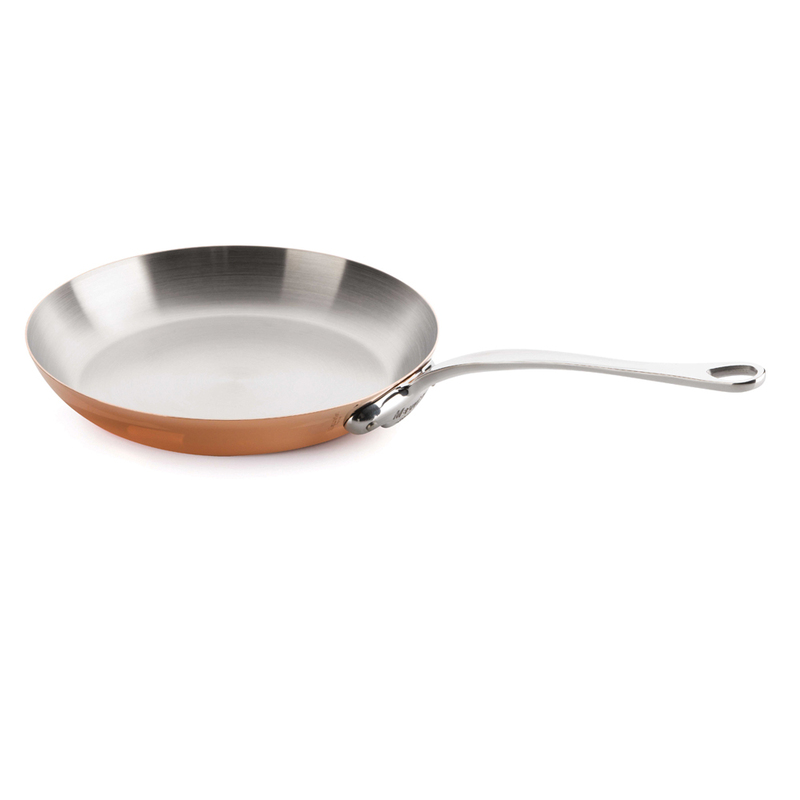 I just bought the Mauviel M'150 copper skillet in 26cm, I prefer 28 cm for vegetables - but I can live with 26 cm, I think. I then use my Le Creuset 30 cm ECI cast iron pan for all the meat searing/roasting I do (and can also put that in the oven). Finally I'm ordering a beast of a Demeyere Pawson sauter pan 28 cm with lid in stainless steel for braising and sauter vegetables & risotto in liquid. For grilling meat I have the Staub 26 cm ECI cast iron grill pan. I think this covers most of what I do, when itr comes to frying pans in the home kitchen. If the Mauvial copper pan impresses me, next up is a Mauviel M'150 22 cm Copper sauteuse for sauce making and small risotto ! (03-11-2017, 07:18 PM)doc47 Wrote: I invested in rubber handle covers for my pans after I posted. They will protect against heat and should make the handle a bit larger and much easier to grip, or so I am hoping. I also purchased a 10" so I have the option to pick the best size for the preparation. (tardy reply) I, too, put a “rubber” (silicone) handle* on our Matfer Bourgeat carbon steel skillet, and I regret having done it. The handle I purchased fit very snugly around the handle; I like that it is secure. However, the seasoning has worn away in one portion of the cooking surface (I guess I am in the habit of placing the skillet on the burner with the handle always pointed in the same direction (for holding in my left hand), and using the spatula, spoon, or whatever in my right hand, so the same spot gets used over and over and over.) Now, I want to re-season the pan, as I did initially, with several cycles of thin wipings of flaxseed oil interspersed with sessions in the oven at 500° F. But, although the handle is heat resistant to a pretty high temperature, I am fairly sure it could not withstand the baking in the oven, and it is so snug on the handle, the only way I could possibly remove it would be with shears. Actually, I'd leave the silicone handle on and season it. These handles will protect your hand to 464 degrees without melting so they should take a 500 degree oven; or, drop the temp down a few degrees, I don't think 500 is a magic number. Mel, it can be easily reseasoned on the stove top. Just get it good and hot (smoking) then rub a just damp with oil paper towel over it. Too thick a coating won't work. It must be microscopically thin. Then continue heating. You deliberately want it to smoke, so do it either outside or under an exhaust fan. Adjust the heat as required to keep the pan smoking hot but not in flames. Let it cool and check to see if the oil polymerized. It'll be dry to the touch if it did. If you want a thicker coating of non-stick then just repeat the process. If it didn't polymerize just heat it again and keep it hot longer. Matfer suggests a different method, that's easier to do, but a bit more involved. It uses salt, oil, and potato peels. Put a mess of salt in the pan, 1/4 cup or more, then moisten it with the oil you want to use for seasoning. You don't want it runny, more like a sort of paste. Add the raw potato peels and turn the heat to medium. Moving the mixture around in the pan you want to crisp up the peels. When the peels are nicely crisp the pan will be seasoned. You'll notice the seasoning develop. Move the pan as required to get the heat and seasoning exactly where you want it. That's the nice thing about steel, one can see the seasoning develop since the unseasoned pan is grey and the seasoning is brown (turns black given enough use). After it cools just wipe the pan out of the salt and crispy peels; it's seasoned. (03-10-2017, 01:16 PM)DonnerJack Wrote: After getting rid of some pans (got rid of all my nonsticks, and mothballed my cast iron), I'm thinking about a daily driver from carbon steel. I usually cook for two, so the dilemma is between a ~12" and a 10". This is of course the outer diameter, and not the cooking surface, but that's how it's measured. You got rid of your nonsticks and your cast iron? I haven't turned against either of those.